This is quite new to all of us and was most challenging part of the meet till now. As soon as we come across it after caving, many of us were not willing to do it. Some tried but come back after reaching mid-way. 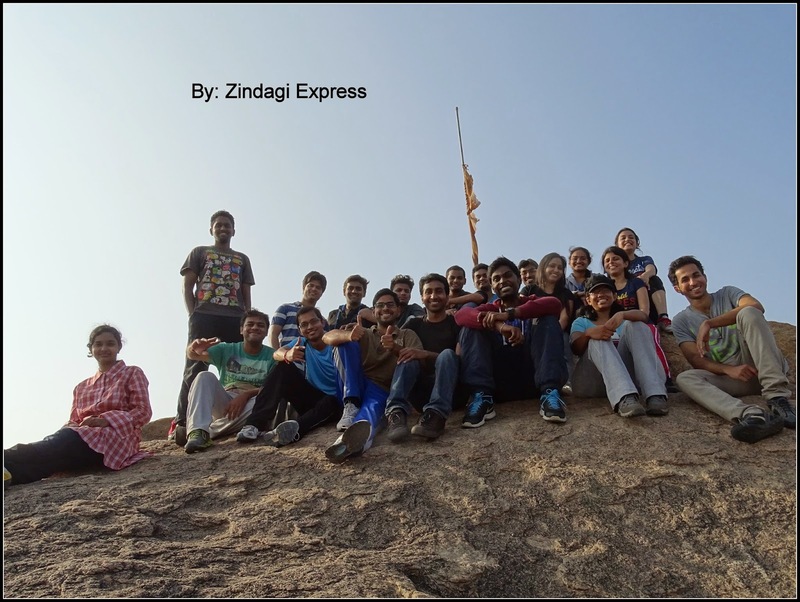 It took good time; however, with the help of trainers as well as push, we all conquered this also and reached to the top. Now, it was time for some rest. Splendid view at the top, cool winds were giving the feeling of being alive. We played some small games, take pictures, gossiped and traversed our way back. While coming down again there were lots of worries but no other option than to come down. I also got some scratches at my back due to sharp stones but that is absolutely fine against the happiness of conquering this and having tried something new. After returning, there was 1 more round of Caving. This round looks easy but was very difficult for fat people. Despite several warnings, I decide to ty this but since I will be qualified in those fat people, I was trapped in between the rocks. All the people were cheering me from outside and were shouting name saying c’mon but I was not able to breathe properly even move by body because I was completely fitted in between the space. I was quite scared and thought what will happen now. I was not even able to raise my head, leave about taking the turn. But slowly, after making very tiny moments, I managed to get out in 15 minutes. I was profusely sweating. Thanked god and everyone. When I was inside, people were constantly taking my pictures and that flash on your face you know how irritating it was. I thought maybe they will earn some extra bucks by selling this pic to media. Media, these days, you know, I have no good words for them. With this, everyone open their refreshments and share about their experiences. It was time to give money to the organizer. Finally, we call it a day. We are still in contact with each other. That is the beauty of this GHAC club. It was at around 10.30 am when we finished all this. It was quite a feeling for me to spend some good 5 hours on Saturday morning at such a beautiful place which would normally be reserved for hangover of the previous day parties. Yes, this is one of those steps I am taking to make my life and lifestyle more simple. This all package will cost you 50 bucks and is come under Easy/beginner level. Can you believe? Thanks a lot for encouraging.